I had expected there to be a thunderstorm tonight so was resigned to riding on the trainer if I was going to ride at all. Then it turned out to be warm and sunny, but windy. Very windy. At least it was a steady wind. Road to Nepal was calling me, but my left calf did not heed the call. There were complaints. Niggles. Then a cramp while going up one of the steeper hills. I dialed it back a bit and kept going, trying to stay straight in the wind. I was hoping my calf would get with the program and settle down, but looking at the long hill where you turn left, I made the call to turn back. The wind was shifting a bit more south, which would make it nice going out, and hell coming back. I'd had several spasms or cramps, and didn't want to have one on one of the big hills. It wasn't always going up, I got one just coasting coming down once. From there I took a scenic route home for a 1.5 hour ride. The thrill was coming home on 37 St. This is not my favourite bit of road by any means, but I'm on it a lot because it's the only practical route to get to some of my favourite roads. 37 St is narrow, there is no shoulder to speak of, and the ditches are brutal. Bailing out is preferable only to the certainty of being struck by a car. There I was, going north, leaning into a strong west wind. (At one point going west, uphill, I was going 40 Kph in dead calm.) I could hear a truck coming up behind me slowly, timing it to avoid the oncoming traffic. More cars show up over the hill and the truck eases past me, actually giving me lots of room. The problem is that it's a high sided panel truck of some kind. As he got beside me the wind stopped. If anything there was suddenly a wind swirling around the top of the truck pushing me towards it. You can bet my eyes widened and I steered very carefully for a few seconds. All in all good practice for dealing with cross winds, even if it wasn't the ride I was hoping for. After a ride or run I usually pop into the cul-de-sac behind our house. 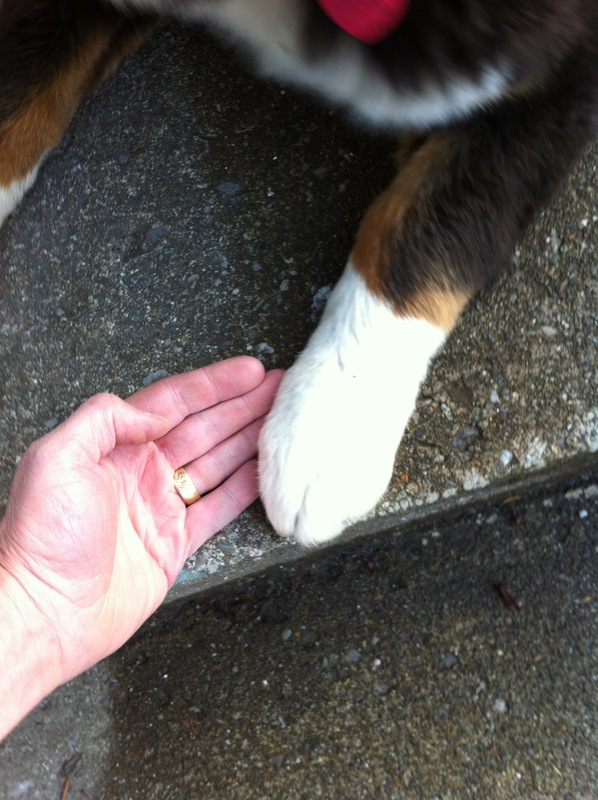 Tonight one of my bike buddies was out working on his lawn and we chatted a few minutes. It turns out we both work at the same place! How's that for a small world? He's just got a new road bike and is eager to get out for a long ride on it. Stretched a bit, but the calf is still feeling weird. Lastly, for Calgarians. The Devonian Gardens are still in progress, but stuff is happening. Here's a couple photos. Maybe by next winter they will be open. We can hope. How well do you know your outside artwork? Anyone care to take a guess which building these paintings are on? I saw them for the first time the other day, and I've lived here most of my life. We've been planning this run for weeks. Obsessing over every little detail, wanting it to be perfect. Well, maybe it wasn't quite like that, but we've been talking about it for some time, and today we finally did it. 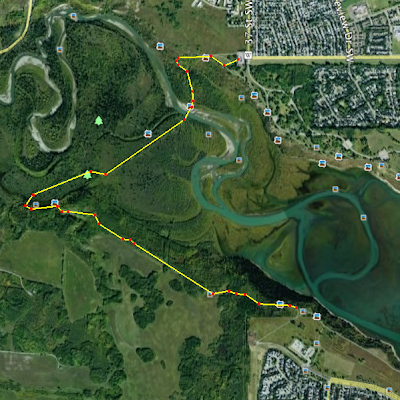 This is part of the run course for the Calgary 70.3, which both Deb and I will be doing. T2 is just to the right of the top red dot. 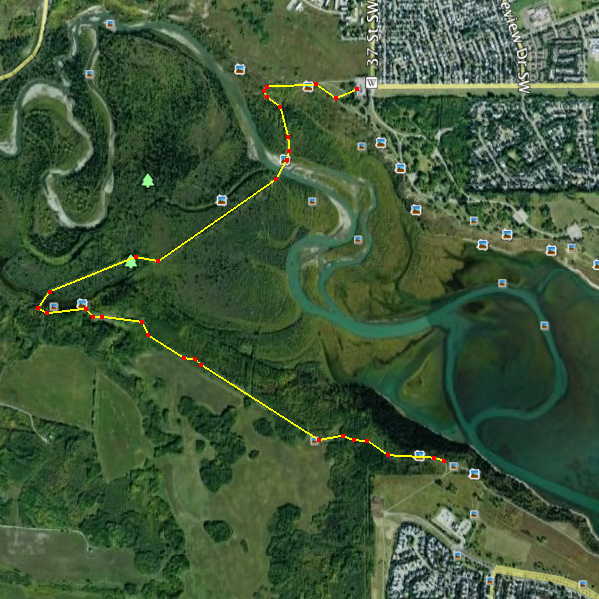 Those interested in the actual run course can go look it up. The interesting part is down the hill into Weaselhead, across, and up the other side. The run course goes further then comes back. We turned around and went back. Here's what T2 looks like this morning waiting for them to arrive. It's calm and quiet, though the clouds are kind of dramatic. I was surprised how many people were out. Lots of runners, walkers, and a few hikers. One couple doing yoga in a grassy area. Dog walkers. A few people on bikes. So here we are in the parking lot, chatting up a storm. You all know which I am, and I'm sorry I ruined the picture. The two good looking ones are Sophia and Deb. They will be posting their own pictures on their own blogs. Sophia can't run at the moment but we worked out something. I rode my hybrid up. It's probably about as fast as driving there would be, or faster. Plus it got me warmed up, even though it was a cool day. I dropped the seat a bit so Sophia could ride with us. After we took the shots Sophia and I realized we were both wearing our fan shirts, and wanted to get another photo. This one was really dark for some reason, and I had to play with it in Snapseed to get it even this good. We didn't do the whole loop in N Glenmore, but we did find a bathroom. Deb and I were comfortable running at the same pace, chatting away like mad, with Sophia right behind us, whipping us on, exhorting us whenever we slowed down even a little bit. Once we got running it was the perfect temperature. No bugs. Coming back I had to stop and take these shots. We had run over the bridge and followed the path south and left out of the picture. We ran to where the 37 St path joins up and turned back. I think we did between 8 and 9 K, but I'm not really sure. Deb may have Garminized it. The water level is way down in the reservoir so there is much more wetland to see. I'm sure the ducks and other critters like it. The views are beautiful! This is looking south and west. I used Snapseed to push the photo a bit using the various filters. Then pushed it a bit more. I really like this shot. Here's another view of the wetlands, looking south and a bit east. Standing at the same place I took this panorama shot. If you look carefully you can see the mountains. Normally I'm not big on riding or working out with other people, but this was fun! It's the first time Deb and I have met in person, though we've been mutual blog readers for a while. The three of us have quite a bit in common re: weight issues, deciding to get more fit, and balancing our lives overall. Deb and I have made tentative plans to ride the Chinook Oly bike course, though there aren't many weekends to choose from. Hmm, in fact, only the weekend before Chinook is possible for me. 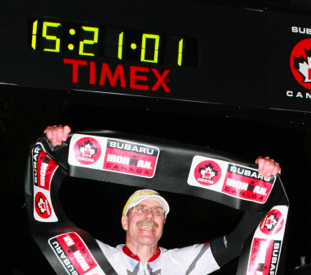 In turn, I want to ride the 70.3 course again. It's been a while and it's beautiful, though the part through Cochrane is a bit hairy in places. I'm actually quite impressed with both my buddies. They have made some life changing decisions about becoming more fit, and challenging their own assumptions about themselves. They've kept at it, balancing family, and work, and everything else. They are living proof that people can change their lives, gradually pushing their minds and bodies to places they wouldn't have believed possible a short time ago. Sophia is at least thinking a little bit about triathlon, though that won't happen for a while. That's ok. Yes, we encouraged her, just a bit. In other news, I'm on a low residue diet this weekend. Monday I chug a gag inducing liquid that has other inducing properties as well. I'm already stocking the guest bathroom. No FaceTime calls on Monday please. For your own good. Then Tuesday portions of my anatomy that have never seen daylight are captured on video. I think that's all I need to say about that. For the people who have been encouraging me to get a Twitter account, I was seriously considering Tweeting a moment by moment account of my adventures. It seems a suitable revenge. I love my yoga teacher. She's the best one I've ever had. Wed night class was this long flow, lots of side stretches. Right leg forward, going in and out of various warriors, right leg forward, ecstatic dancer, right leg forward, lots of side stretches, and bends and lunges right leg forward, working back through the sequence, and forward again through part of it, and back through it all, right leg forward. Then it was time for this very lovely supported stretch and meditation, and I even did the savasana in the same supported pose. From a technical yoga perspective, did anyone notice what was, from the exalted point of view of yoga purists, ever so slightly wrong? My left leg was feeling weak and feeble anyways. Thursday should have been a bike ride. It was nasty out. And besides there was a bit of a reunion from a place I used to work at. One guy has had a bit of a medical adventure over the last couple years and seems to be coming out of it now. Which is nice, and good. So someone organized an evening out with him, and a dozen or so people showed up. It was so nice to connect again with him and his wife, who are as nice a couple as you could ever hope to meet. Plus the other people that showed up. This is about the balance thing. Not so long ago I would have been bound and determined to get on my bike, and do the workout inside if I had to. Now I'm a bit more relaxed about it, and having an evening with friends is important too. There is more to life than workouts. Friday morning was getting my dental hygienist scrape and polish my teeth. The coffee and wine builds up, but I consider it my duty to drink them so as to keep her employed. I'm considerate like that. It's still cold, as in frost warning last night and again tonight. So I didn't want to get out on my bike. Or even inside on my bike. And I'm not feeling the core workout love tonight. I'm tired and sleepy. Tomorrow is a nice run and bike with friends. Looking forward to it. I was telling someone at work my weekend adventures. They kind of gagged a few times, and said they'd have had a harder time recovering from the doggie diet adventure than the Oly. Given one of the places I've worked at (the one with shift work) it was no big deal. The drive home had me a bit creaky but I was lazy and didn't do much other than the essentials after we got home. Some of you would have considered stretching to be essential, but I wanted something clean to wear to work. 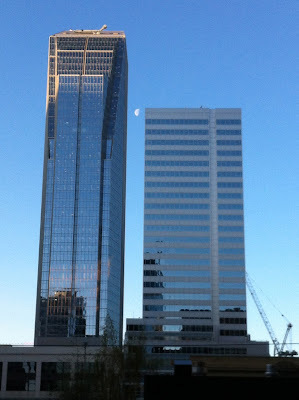 Not that I'm important or anything, but the only office my manager could find for me is in executive country. There are a couple of C level corporate people just around the corner, and I still don't know who's who. The walk at lunchtime was nice, and further would have been nicer. Oh well. Crappy weather rolled in during the afternoon. There was lots of hail on the ground at Heritage LRT station. It had rained hard at home during the afternoon, but the sidewalks were dry. There was bit of blue sky so I changed and zoomed out to beat the rain. Let me rephrase that. I changed, yes, but plodded would be more accurate for the first few hundred metres. My legs were not impressed. My lungs were working much too hard for the pace, but everything settled down after a while. I was trying to go easy, but it was hard to find a pace that my legs wanted to run at that wouldn't have my lungs complaining. I felt a little bit like a geezer, arms swinging like there's no tomorrow, and my legs hardly moving. That lasted 5K. The only interesting thing on the run was right at the end as I was walking. A bunch of cops in casual wear busted some guy sitting in a bus stop. That's the second one in a month or so, though at least this time they didn't have the police helicopter involved. I hadn't realized our neighborhood was such a hotbed of crime. Stretched after. Catching up on blogs and stuff. This was a great weekend, even dealing with Austin the dog's dietary choices. I'll get to it. My current employer makes us not work the Friday before summer long weekends. The office is closed. And locked. I was told my card key wouldn't work, so even if I was so foolish as to want to come into work even though nobody else was around, it wasn't going to happen. So other than saying "Book that vacation" my boss also said, "go have fun this weekend." So I did. Friday I did nothing, except some stuff around the house I don't even remember now, and probably wouldn't interest you. It was nice. Saturday I saw my buddy Katie off for a ride towards the mountains. It was 4 C. Frigging cold in other words. She was happy to have me come along, but I waved goodbye as she pedaled off, wearing a parka and more layers on her legs than I've ever seen before. She had fun, though I missed her when she came back because I was out doing errands. This is a seriously cute dog. However, as with all dogs he has serious problems with dietary choices. I missed him making the choice, being busy shooting shots like this for later playing with. When I caught up to them Cath was telling him to drop it, drop it! I thought it was a stick pointing out of his mouth. Cath asked me to get it out, so I obliged. I got hold of it, and tugged as I was trying to pry open jaws bigger than mine. It was a tail, and I pulled it off the body of the dead mouse. I had to reach in and pull the dead mouse out. Not sure how long it had been dead, but I'm just glad Austin hadn't chomped down. He had been standing there with a sort of "I've got it, what do I do now?" kind of expression. All this was to a sound track of Cath gagging. Somehow, I didn't think to get a photo. Can't imagine why not. The next day we were off to a secret location, for a secret not-a-race, with a secret transition tips given by a secret elite uber athlete, for a selected hand picked crowd that had all shown up at random. There is video footage of this athlete doing a jig and making suggestive descriptive hand motions. I will post the link when I get it. The water was warmer this year. I remember last year we all swam a little long so this year at each turn, me and another girl checked with each and turned together. Maybe we cut it a little short, since I was out of the water in 20 minutes. She took the long way around the dock. I'm a bit puzzled, since I don't think we cut that much off, and I don't think I was swimming that much faster than last year. I guess the transition tips did me some good, I was out of T1 in 4 minutes. I think that's a new record for me. There was a 38 K course marked on flat ground. I never did figure out the wind. It felt like a headwind both ways, but the coming back leg was a bit faster. My bike computer says 38.65K and I was off the bike in just under 1:18. T2 was really quick, and a 10 K run in just under 1:07. This all exceeded my expectations, mainly being able to run off the bike at all. Last attempt was pretty brutal. Bike I wanted to be strong and try to maintain 30 Kph and also be really strong accelerating from the turnaround markers, (4 loops out and back on a highway). I was pretty close to that, my bike says 30.1 Kph average and using the stopwatch says 29.9 Kph. The run I just wanted to run it all, no walking. I never felt really strong or smooth on the run, but it wasn't a clump clump T Rex horror show either. Granted it's a hill up out of transition, but it took a long time to get my lungs and heart rate back down to happy making values. I could have gone longer but I'm glad I didn't have to. Total was 2:50 and change. Happy! Just because, a bike cuddle. That night there was a party with endless food coming off the new BBQ, and lots of other goodies to eat. A wonderful time was had by all. Except that one of the guests works at Freshies, and was late because they had to clean up in preparation for a 2 week vacation. So much for the breakfast at Freshies on Monday idea. I was devastated. On the way back we saw lots of cyclists on the road. Most between Turner Valley and Calgary, but there was a small group way south of Longview. Good on them! I've been a slacker the last couple days. A weenie. It's been cold here. Snow was forecast, but none came here. About the only thing of note is the perennial struggle with dandelions. The interesting thing is going into stuff that's been stored away for a while. I opened up the Zoot travel bag of many pockets. I'm still not convinced I have discovered them all. Buried in there I discovered two extra tubes and a bunch of CO2 cartridges. There are a great many swim caps in there. 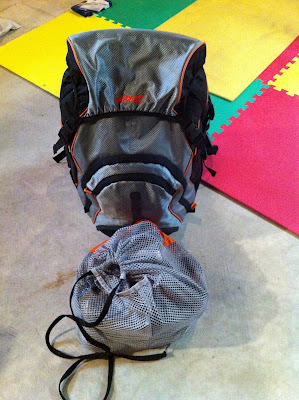 The Merril mesh bags are beyond handy. I wish more races gave them out. Katie dropped by this morning to ride out 22X and wanted to see if I would come along. Not. Remember what I said about it being cold and me being a weenie? She was wearing a parka. It was about 4C. Later I ran into Todd H at the Farmer's market. He's doing IMC again this year, going through a bit of a different training program. Says it's going really well, which is good to hear. I'll have to follow him on the big day. FF runs a great yoga class. I think word is getting round as there are lots more people in this class than there used to be. Besides the yoga itself, which is really good, and often has been slanted to exactly what I need, there is F herself. She has her own style of doing things. Take this instruction tonight, for example, to avoid saying left or right. "Put the inside foot over the foot that is the other foot." I know ballroom dance instructors that would give their eyeteeth to be able to give that sort of instruction with her aplomb. It all worked out. I was really liking the fire log pose, which I didn't use to be able to do. So did the swim this morning, about 45 minutes worth, mainly watching the kids in the next lane go zoom. At one point I was pacing a guy doing backstroke. A slow recovery backstroke, while I was doing a strongish freestyle and oh so slowly creeping ahead of him. I'm settling into work, trying to get into the habit of eating lunch then going for a short walk. It's been so nice the last few days, and Stephen Ave is crowded with people to watch. In playing with Snapseed I brightened up a pic from Bermuda. This is the formal bandstand in Hamilton, before and after. This isn't your average backyard gazuba. It's pretty big. I was a slow creaky mess getting out of bed this morning. All that gardening yesterday really took it out of me. Fortunately I wasn't in a rush, so filling the water bottles, arranging nutrition, changing the bike tire, and all that other stuff could be done in a slow, orderly sort of way. With coffee. Here's a pic of the new equipment I was trying out. My regular glasses are underneath them. This worked out great! It was sunny and warm today, very sunny, very warm. My eyes loved it. My regular glasses protect my eyes from some wind, and before today I'd never realized how much I had been squnching my eyes up. Today was very relaxed, which felt sort of odd, but I think I'll get used to it really quickly. I was afraid they would slide down or block my view but none of that. Neither were they so tight as to press on my head. No problems with my bike helmet. I can't snug my regular cap down quite as much on the run, but now I don't need to. The bike ride was down to Turner Valley and back, total 92 K. I'd been thinking about going to Black Diamond but decided not to. Even though it was almost the two year anniversary of my banana whapping ride to Black Diamond. I still wasn't feeling strong as I started. There was a strong headwind all the way south on 22, after a strong crosswind on 22X. When I say strong, I mean between 20 and 30 Kph with some stronger gusts. Or maybe attacks of being feeble. I spent a lot of time on the drops trying to cheat the wind. I didn't use to be able to do this for very long. I can feel the difference in my hip flexors. There was a point where I woke up and realized I'd got behind on nutrition and hydration and was just pedaling along. Ate and chugged some energy drink and felt better pretty quick. I don't think I went any faster against the headwind but I was feeling better about it. I turned around at the first intersection in town. No cars, and I badly wanted to be moving fast again. The wind pushed me north, hardly having to pedal at all. Well, that's not true, but it sure felt that way after going south. Coming back along 22X was cross headwind again. At the 3 hour mark I was starting to feel a bit tired overall and more than a bit tired of the wind. Back to the house at 3:25. What was really nice about the ride was that I passed 5 people and nobody passed me. That is very unusual. Almost everybody waved, and there were lots of people on bikes today. Plus a great many on motor bikes. Some of them are very loud. There have not been too many runs off the bike lately. I was in the house long enough to pee and change shoes, then start to run. It was awful! My legs felt badly bow-legged and did not want to run at all. I shuffled along trying to keep my steps quick. No hope for keeping them light at this point. I was breathing like a steam engine though I was hardly moving. Eventually my breathing settled down and my legs felt a little better. That was enough for me and I called it. Rolling my feet on the T ball felt wonderful! Stretched and put my feet up. After showering I fired up the BBQ for bison burgers. Oh, so yummy! Then a nap. My morning run got cancelled at the last minute so I stayed home to read the papers, drink coffee, and relax. That lasted a couple hours. Then came the workout. Yes, I'm calling it a workout. Lots of muscles being used in multi-planar motions and heavy breathing. Not much cursing. Some thoughtful pauses. Bricks. A few slivers. There was a hydration and nutrition plan. Sunscreen. And you thought I was going to show you the garden. Hah! I like to keep my readers wondering, and giving them unexpected stuff. Today was digging out the overgrown borders around the flower boxes in the front yard. There is this woody shrub that is taking over, and it's very hard to get out. I'm sure I scattered a million seeds as I was doing all the digging. I had to pry out the brick border to get the roots. The bricks were covered by an inch of soil, roots, grass, and whatever else builds up when mother nature is let loose. I basically dug it all out as best as possible, while trying to save the lady bugs. One of the plants and rootball together were big enough I had to think about picking it up after I managed to pry it out. This was a solid ball of roots that looked like a completely root bound plant. 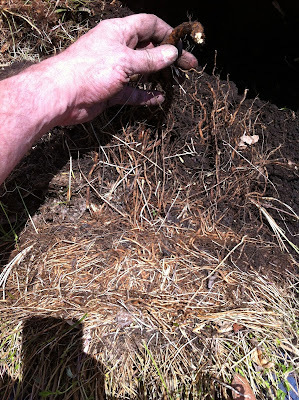 Here's another one mostly dug out, showing the size of one of the roots. That whole mess is overflowing most of my lap. What's left looks like crap at the moment because nothing else went in, and I paid no attention to smoothing things out. There are still roots and grass in there to be dealt with. Maybe next weekend, or possibly some week nights. The patio was thoroughly raked, and that small area produced nearly two garbage bags of dead stuff. There is still a bit more to go. I earned my glass of wine out of that. It took a long time to wash my hands and arms to get all the gunge off. Then scrub them with a nice sugar body scrub. Then hand cream, which I don't normally use. My hands are sucking it in. What I didn't tell you about Thursday was a lovely dinner out to celebrate signing the contract for my new job. I'd been working under an interim agreement in principle, but it's nice to get it all sorted out. We went to the Selkirk Grill in Heritage Park, and we waddled out after two wonderful hours. The food there is very good, and we had the place to ourselves. I had my eyes checked this week and I'm sure you will be all happy to know they are fine. My prescription changed again, of course, so I have to buy new glasses. The current ones have lasted 4 years so I have no complaints. Besides, they are all scuffed up from leading an adventurous life. The only downside is that the pair of lenses were about $700! Considering that I'm getting 6 different and complicated prescriptions in one pair of glasses I suppose it's not too bad, and some of it is covered by insurance. Lots of people wear the cool Oakley or Rudy Project sunglasses when racing. I've got a set of clip on sunglasses in the car, but it's much too fussy for racing. I had been thinking about asking the eye place if they could take an old pair of lenses and glue them to the inside of the sunglasses. They had sunglasses there and can put a prescription lens into them but it's a single vision lens, same prescription for each eye. They won't work for me. But what they did have was sunglasses built to go over top of existing glasses. So, are these cool? I'm going to try them out on my ride and run tomorrow. The GVBP is done. Done. Done. I only had to pull all the junk out a little bit and I could get at what needed to be done. Yay me! Friday was a 2.5 hr bike on the trainer, with The Sting in the background. I love con-man movies. Warmed up, steady at the top of endurance pace or so, then some short intervals, with a cool down and stretching after. Then came the hard stuff, working on the yard. We are just downwind from a 7-11, and there are lots of slobs that go in there. We are always picking garbage off our lawn. First time this year to mow it. There are some bushy Thyme plants, pretty sure it's Thyme, that have escaped are are trying to take over. Uprooted some of them and cleaned out beside one of the flower boxes. I quit when I filled up our black garbage bin. You can see the place I had already cleaned up earlier in the week, starting at the mint plant and working to the right. What I worked on Friday is along the other leg of the flower box. Saturday, snowy Saturday. Where the bricks are stacked on the flower box is where I had cleaned up. Lots more to go. Once stuff is in the flower boxes I'll get lattice back onto the frame work. It changed from kind of thick rain to heavy snow in the course of one cup of coffee. My sports medicine Dr. Dale MacDonald was putting on a running seminar at Mount Royal University. I even knew where the class was because it's in the same building as some of my Business Analysis courses. However the parking has changed. The new parkade is built and the lot I was going to part was taken out of operation. So there I was going around the block making left turns, trying to figure out how to get into the parkade. Not a good design. The seminar was good. Some things I'd already known, but it's always good to be reminded. There was slushy water all built up in the gutters that needed a bit of encouragement to flow. Afterward we had a quiet afternoon and evening reading. Sunday I finished up the last of the actual vapour barrier taping, and put stuff back. There is still a bit of organizing to be done, but things haven't been this clean and tidy down there for a long time. Onto the trainer for a ride. Short, intense. Warm up, then spin at transition between endurance and tempo pace. Then short intervals up around FTP, sometimes trying to recover at endurance pace. Cool down and stretched. 1.5 hrs. If I'd waited till later in the afternoon, like about now, it would have been an almost reasonable temperature for an outside ride. During my ride I kept getting this funny ammonia smell sometimes. It was a little bit like cat pee, except we don't have a cat these days. During easy bits I was smelling my towel, smelling me, because I was the logical suspect and yes I'm soaking wet from sweat. Except that fresh sweat typically doesn't stink. It turned out to be my cycling gloves. Took a sniff when I was taking them off, and that was it. Golly, sweat into something leather every ride for nearly two years, and it starts to stink. What kind of customer service is that? I already know the vinegar trick to soak sweaty kit in to take out the stink and do it periodically. But does it work on leather?